Posted on July 2, 2015 by Ahmed H.
Set deep in World War I, All Quiet on the Western Front follows young German recruit Paul Baumer as he details his wartime experiences from signing up for the war with his graduating class to fighting in the trenches of the unforgiving Western Front. The war novel was written by German war veteran Erich Maria Remarque, and was published in 1929 to the dismay of the Nazi regime. It tackles ideas of loss, hope, adolescence and growth, and provides an in-depth look in the human condition. One thing I noticed right away was Remarque’s uncanny ability to describe the setting at which the book was taking place, whether at a training camp, the Western Front, or Paul’s hometown in Germany. The author detailed descriptions of the hardships in the trenches, from the gnawing rats to the constant pounding of shells above, is so well written that you can’t help but get immersed into the setting. The characters all interact with each other in a realistic, believable manner for the time and dialogue is heavy with dialect and references. The character development is great, and is one of the major themes of the story. The impact of the war on the soldiers is apparent and is shown subtly through differences in actions and speech. I felt that the pacing of the story was excellent for the most part as well. The story starts o ff near the battlefield, then switches between the trenches, training camps, or in other locations far from war. This keeps the setting fresh and doesn’t drag on in one specific location for too long, except the hospital chapter where I felt it was dragged on for a little too long. The effect of the war on the soldier is a huge theme. Men in war lose all identity and the futures of the young recruits are ruined. PTSD plays a role along with various coping strategies and defense mechanisms soldiers use to compensate for the horrors of war. Because of these, the story has a lot of dark and mature themes, coupled with explicit violence that makes this a story that none under the age of 13 should be allowed to read. For anyone else though, this is a phenomenal war novel that analyzes human race as a whole, I definitely recommend it to anyone looking for an insightful, historical novel. All Quiet on the Western Front is available for check out from the Mission Viejo Public Library and Axis360. 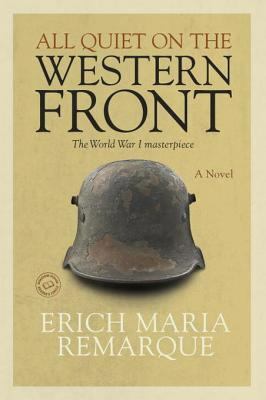 This entry was posted in Book Reviews and tagged all quiet on the western front, book, eric maria remarque, review, war, world war i, ya by Ahmed H.. Bookmark the permalink.